Fifteen years ago today was a day that changed our country. Never forget! Most of us remember that day vividly. Just as the generation that lived through the bombing of Pearl Harbor—A Date Which Will Live in Infamy.I hope these and other such days will never be forgotten. We cannot afford to forget. Innocent lives were lost as a result of these attacks. Even one American life is too many. As the saying goes, time heals all wounds. I don’t think so, I think we just learn to live with the loss and cherish the memories. It is very important to not forget these tragic incidents. When we do, we are destined to relive them again. They were horrific and unpleasant to remember. Some people just want to forget them as they were so bad. As a result of September 11, 2001, the country came together and, with the rest of the free world, attacked a new type of enemy—an enemy that was not a nation state but an ideology that spanned many nations. As the years went by, the wounds of September 11, 2001 shifted to memories of the ones lost as which they should. Unfortunately, the war against the ideology drug on and as the Free World made significant strides in the War on Terror, the politicians soon lost their will to fight. As politics changed, it seemed as if the entire Free World took the approach of peace at all cost. We suddenly were no longer fighting the War on Terror. However, the ideology we were fighting morphed into a religion. Unfortunately, we have not achieved peace but a more dangerous world. Our adversary is cunning, patient, and dedicated to his cause. The war is not over. The radical Islamists will continue with their fight to destroy us. We must never forget the past and keep our guard up. 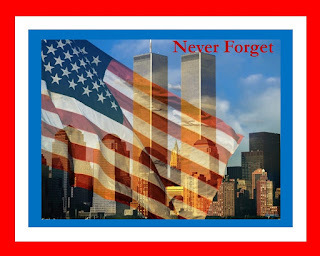 Never forget September 11, 2001. One more life lost to the terrorists is too many. Hold the politicians accountable and let’s unite the country once again. Let’s get the country back on track and prevent future attacks.